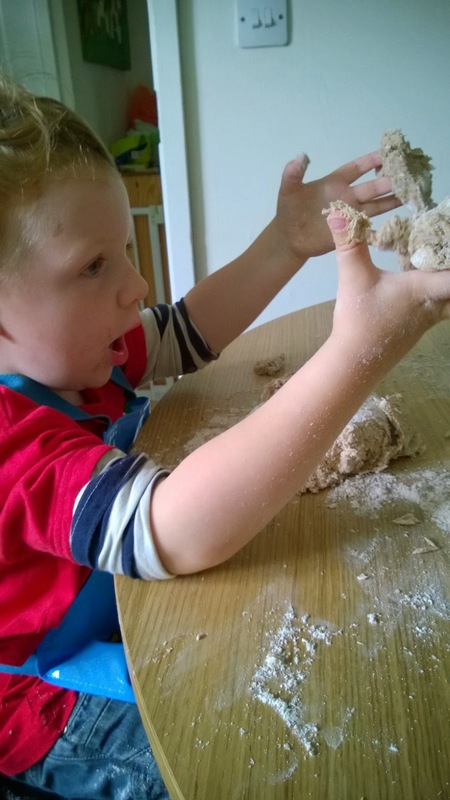 Have you ever worried that making play dough might be a bit wasteful of a food resource? Why not make sure that less of that dough ends up in the compost heap by sometimes making bread instead? The key skills are measuring, pouring, stirring and kneading, plus the sensory experience of smelling the yeast and feeling the texture of the ingredients. This activity contributes to self esteem and helps to build a healthy relationship with food. The recipe I've developed here uses spelt flour (explanation at the end), but you can substitute with regular strong white or wholemeal wheat flour if you prefer it or can't get hold of spelt, in which case increase the flour quantity to 475g. I used wholemeal spelt, but I prefer to mix half and half wholemeal and white spelt if I have them as it makes a lighter loaf. The original recipe was on a packet of Allinson wholemeal bread flour, but I have fiddled with it to make it work better for spelt flour. I used 15g dried active yeast but you could substitute for a 7g easy bake yeast sachet. I like making up dried active yeast because I think it may be gentler on the tummy, and also it makes it more obvious to the kids the role that the yeast plays in the baking process because they can see it bubbling up. Step 1: Mix 100ml cold water with 50ml boiling water to make warm water, stir in 5g (1tsp) sugar and sprinkle 15g (1 tablespoon) dried active yeast on top of the water, then whisk in thoroughly. Leave for 10 minutes or so in a warm place until about 2cm of froth is on top, then stir this back in to the water - it's ready to use. You can explain to your kids that the yeast is a tiny fungus that is asleep when it is dry, but by getting it wet it wakes up and starts to multiply. The sugar is it's food - the yeast eats the sugar and 'burps out' carbon dioxide bubbles which make the water go frothy. It is these bubbles which will make the bread rise up. Step 2: Help your little one to measure out your wet and dry ingredients ingredients into separate containers - 400g spelt flour, 1 tsp sea salt, 150ml warm water and 15ml (1 tablespoon) vegetable oil (cold pressed rapeseed oil is a good flavourless nutritious oil which won't produce bad things when heated), plus of course your 150ml yeast mix. If you use a sachet of easy bake yeast, make sure you still have a total of 300ml water. 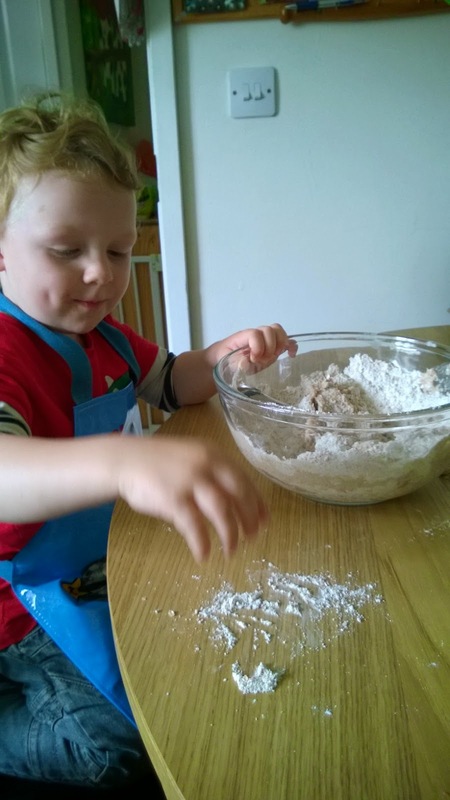 Step 3: Help your child to mix all the ingredients together - we usually use a spoon to stir it all initially so we don't get too sticky as Toby is not a fan of sticky fingers. Once it starts to come together, proceed to step 4. Step 4: Tip the bowl out onto a clean surface and gently knead it by squishing, folding and stretching until it has a silky feel. If it's sticky add more flour, if it's crumbly add more water. Spelt flour is a bit different to wheat flour if you're used to baking with that - the gluten doesn't require such a heavy working so you don't need to knead it anything like as much. Step 5: Put on floured baking sheet/ floured loaf tin, cover with clingfilm and leave in a warm place until it doubles in size (about 30 mins). Step 6: Remove clingfilm and bake in a preheated oven at 230 degrees celsius for 15mins, then drop the temperature to 200 degrees celsius for the rest of the bake - about 15 more minutes but it depends on if your making buns, a large loaf or two small loaves. I bake by nose mainly, then test by tapping the base of the bread - it should sound hollow. Leave to cool then enjoy with yummy home made soup. Notes on spelt: spelt is an ancient grain related to wheat but different from it. It fell out of favour because it is harder to remove the hard outer case by threshing but modern machinery has now been developed to deal with this. Nutritionally it is superior to wheat - the good bits are inside the grain and are not lost when it is processed as in wheat where the best bits are on the outside of the grain. Spelt is higher in protein than wheat and contains all nine essential amino acids that our bodies need through diet because we can't make them ourselves. It is also higher in certain B vitamins and iron than wheat. It is not gluten-free, but the gluten is different to that in wheat so some people who are intolerant to gluten get on better with spelt - it is not suitable for coeliacs though because it does still contain a form of gluten. Spelt is more delicate to use than wheat flour - if you use wheat, give it a lot more of a whalloping when you knead it - for at least 10 minutes - and I would recommend double proving wheat flour dough - let it rise, then knock it down and rise it again as this produces a better loaf that is easier on the tummy. Notes on cooking safety: usual sensible stuff - clean hands, utensils and surfaces needed and keep little ones away from the oven and the bread when it is hot out of the oven. I try to avoid them eating a lot of dough, but they've had no problems from munching on a bit of it.